Since I'm on a 3D choropleth jag, I want to address two common problems with prism maps; blocking and lack of north orientation. In my first and second blog post in this 3D series, I explained why I'm using two visual variables (colour and height) to represent the same statistical indicator. This is another good reason; colour might help the user in identifying hidden prisms. 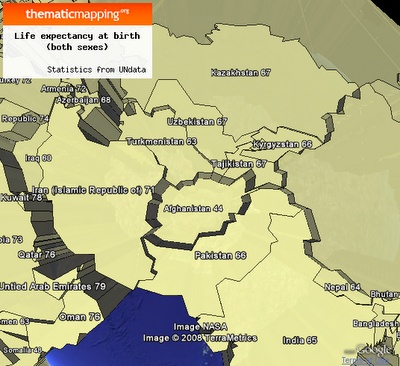 This prism map is created with the Thematic Mapping Engine, and shows life expectancy at birth (both sexes) in 2005. I'm not using a colour scale to represent the statistical value. The prism representing the low life expextancy in Afghanistan is hidden behind Pakistan. If you look at the prisms from above, the "shadows" helps you to identify the lower life expectancy in Afghanistan, but it's hard to measure the relative height. 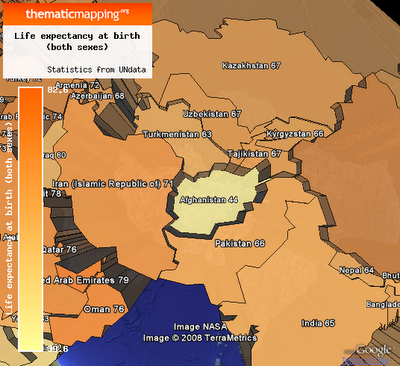 By adding a colour scale, it's easier to see that Afghanistan is experiencing lower life expectancy than the neighbouring countries. This is a suggested solution by Slocum (2005/70). Not everyone likes this approach. Two different visual variables (colour and height) might also mean two different statistical indicators. I think it would be more confusing to combine two indicators on a prism map like this. I would appreciate more feedback about how people precieve prism maps using both height and colour for the same statistical indicator. I agree with Cory that combining two indicators might be more interesting (depending on what you are looking for), but I think another approach could be used with greater success. I'll return to bivariate mapping later. A reason why KML is good for thematic mapping is the FlyToView, Camera and LookAt elements. By using these elements we can automatically fly the user to the best "prism viewing location" (not so easy with whole world visualisations...), or to the location where we want to draw the attention. This might create another problem, as rotation and perspective might produces a view that is unfamiliar to users who normally see maps with north at the top (Slocum et al., 2005). This is a bigger challenge for paper-based prism maps than digital ones, since the user can switch easily between different scales to restore geographical orientation. Still, we're here at a key point: 3D visualisations tend to impose severe interaction demands on users (Shepherd, 2008/201). This can also be beneficial, as the user might learn and see more in interactive and explorative environments. Shepherd, I. D. H, 2008, “Travails in the Third Dimension: A critical Evaluation of Three-dimensional Geographic Visualization.” Book chapter in Dodge, M., McDerby, M. and Turner, M., 2008, “Geographic Visualization: Concepts, Tools and Applications”, Wiley. You have developed some impressive 3D-globe-prism techniques. However, there are a lot of factors that make these objects difficult to interpret. The globe aspect hides 50% of the data from view and grossly distorts at least another 25% of it. It is difficult to judge the heights of the prisms, because the perspective changes, and taller prisms obscure shorter ones. 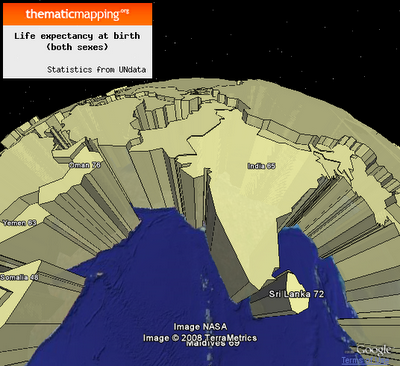 I agree with Mark Harrower that Virtual Globes are a seriously bad idea for thematic mapping. I do acknowledge the factors that make prisms difficult to interpret. I think 3-D prism maps have both pros and cons. I don't agree that the virtual globes are a seriously bad idea for thematic mapping, but it's certainly not the only nor the ultimate way of showing thematic maps.